Her Majesty the Queen has written the foreword to a very special book being published to celebrate her 90th birthday. The Servant Queen - and the King She Serves is a beautifully illustrated short book, which uses the Queen’s own words to draw out the central role of her trust in Jesus Christ, offering an inspiring, multi-faceted insight into a life well-lived for others. Thousands of churches across the country will be giving away copies of this unique tribute published by HOPE, Bible Society and the London Institute for Contemporary Christianity. Paul Woolley, Deputy Chief Executive at Bible Society, said, "In drawing attention to the central role of the Queen’s faith in her life and reign, The Servant Queen will be a unique 90th birthday publication. The book will inform, surprise, entertain and challenge, all at the same time." Co-author of the book, Mark Greene, Executive Director of LICC, added, "As I’ve been writing this book and talking about it to friends, to family who don’t know Jesus, to my Jewish barber, I’ve been struck how very interested they are to discover more about the Queen’s faith. "The Queen has served us all her adult life, with amazing consistency of character, concern for others and a clear dependence on Christ. The more I’ve read what she’s written and talked to people who know her, the clearer that is." 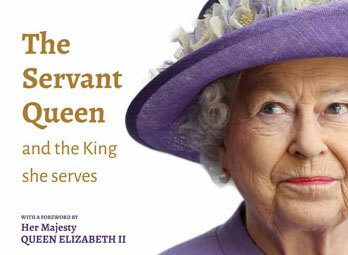 Advance orders for The Servant Queen by Mark Greene and HOPE’s Communications Director Catherine Butcher, have already reached more than 50,000 with Anglican dioceses and Christian denominations ordering copies to give away. All the resources will be available from February from www.hopetogether.org.uk.